Since the launch of Windows 8, many users have been waiting for something that does a better job of spanning the gap between laptops/Ultrabooks and tablets. We’ve seen sliders, twist screens, laptops with touchscreens, foldable laptops like the Yoga, and even a few with detachable screens. 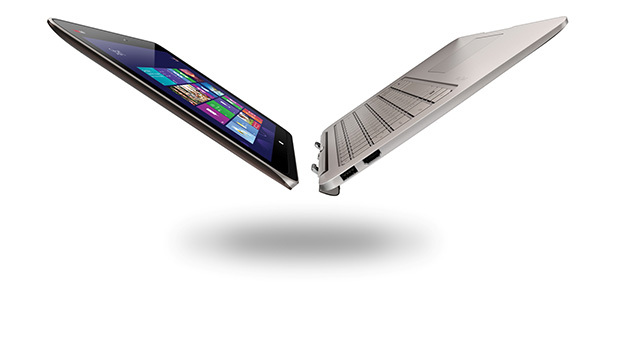 HP now enters the market with one of the latter, as the Spectre 13 x2 that has a detachable screen. Given that we’re talking about Ultrabook internals – and a 13” display – pricing is going to be substantially higher than what you’ll pay for a traditional tablet. HP also goes full Windows 8 here, so there’s no secondary SoC running Android like in the ASUS Transformer Book Trio. HP hasn’t yet provided us with a full rundown of the specifications, but it appears the Spectre 13 x2 will sport a 1080p display and the tablet portion pretty much only includes a microSD slot. The dockable keyboard meanwhile adds a couple USB 3.0 ports, HDMI port, and a full size SD card slot; it also includes additional battery capacity and has a backlit keyboard. While the idea of a 13.3” laptop/hybrid is good, I do have to question the utility of a 13.3” tablet. I’ve used Dell’s XPS 12, and frankly it just feels massive when in tablet mode, and that’s a slightly smaller display size. On the other hand, typing on a 13.3” sized chassis and keyboard definitely sounds more welcoming than a 10” or 11.6” keyboard, so the detachable tablet aspect is basically a nice extra for those times when you want to leave the keyboard behind. HP has managed to cram all of the hardware into a fanless chassis, which means they’re likely using the Core i3-4020Y (6W 1.5GHz) and Core i5-4210Y (6W 1.5-1.9GHz); it’s possible HP also supports the Core i7-4610Y (11.5W 1.7-2.9GHz), but that seems unlikely with a fanless design. (I’ll update if I hear anything more on the subject.) Pricing on the Spectre 13 x2 starts at $1099, hopefully with at least a 128GB SSD and 4GB RAM (preferably more, but that’s probably just wishful thinking). Availability is scheduled for October 2013. I don't really see a reason for these hybrids. You either need a traditional 13" ultrabook/MBA to work with while travelling or you can go with a traditional 10" tablet if it's only about multimedia and some email/web/etc. I have no use for a touchscreen on a device ment for work, where I need a keyboard to type alot on a 13" screen. And I have no use for a real keyboard on a 10" tablet only ment for media-playback or some webbrowsing. I'm not sure why you find the appeal of these difficult to understand. When you're working, you have access to a proper keyboard and trackpad, and when you're not, you simply detach it and use the device as a tablet. There's no need to sync data between devices, and it's one less thing to carry around with you when you travel. I am planning on replacing my iPad with an x86 device soon - most likely a Surface Pro 2, but possibly one of the new convertibles - because I'm fed up having to convert media and trying to find apps to support tasks which I have no problem doing on my desktop PC. What these convertibles really need though, is Intel's Smart Frame, as shown in their North Cape prototype. That allows you to have a larger usable workspace when docked because you can use the smallest bezel possible, and then when you undock the display, you have an inch or so around the edge that gets turned off so it's actually usable as a tablet. Microsoft's Surface Pro has roughly a 12.8" diagonal, though the screen itself is 10.6" in size, because you need a frame around it to avoid accidental touches. Now imagine if they put a 12" display in there, almost out to the edges, which shrank to a 10.6" active area when being used as a tablet - with the option of using the full display in tablet mode if all you're doing is watching a movie. It seems like the best of both worlds - a compact device with a relatively large screen for its size. My biggest concern with any of these is the build quality and durability though. While the Surface Pro seems to be one of the worst devices to use as a notebook (only useful on a desk) my main use would be replacing an iPad rather than an ultrabook, and it seems to be the most solidly built x86 tablet by far, on par with something that Apple would make. That bezel shrink concept sounds pretty ideal... In the end there's no perfect config for everyone. I find anything under 12" to be rather cramped for serious work (specially if 16:9 rather than 16:10) and I find anything over 10" to be way too huge for a tablet... Even 10" is pushing it for the way I use a tablet (mostly reading), so I've gone to a 7" for now. I was super interested in the Win 8 hybrid concepts (my previous tablet was a Transformer after all) but at the end of the day none have really sold me and I'd rather have a matte display for work. That's just me tho, I don't travel a ton and when I do I often take the tablet only. I can see someone who travels constantly or who's in college and doesn't need a ton of power preferring something like Surface, or something like the $350 ASUS Bay Trail convertible plus a desktop, or something like a Yoga plus a large phone, etc.